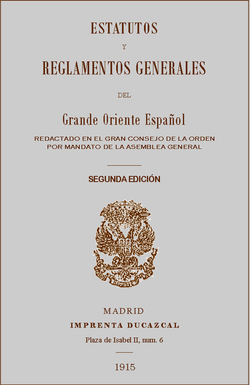 For reasons unknown, the Gran Oriente Español was not pro-active in supporting the cause of the Filipino masons under the Grand Regional Lodge. In order to remedy the situation, Kalaw would propose to the Gran Oriente Español the project for the Constitution of the Independent National Grand Lodge of the Philippines, to replace the Grand Regional Lodge. This would address the question of sovereignty being thrown at the Grand Regional Lodge by the Grand Lodge of the Philippines, despite their both being constituted under a foreign grand lodge, and despite the latter’s being composed of majority American members. Desperate of support coming from the Gran Oriente, Kalaw warned in a letter dated 13 December 1916 to the Grand Secretary of the Gran Oriente Español that should “we be disappointed, I sincerely regret to inform you that I decline any and all responsibility as to the consequences” (Kalaw, in Fajardo, 65). The die was cast, so to speak, for the Regional Grand Lodge to take matters into its own hands and deal with the challenge of fusion, union or continued coexistence characterized by animosity. A real turning point happened on 18 January 1917, when Miguel Morayta died in Spain. With Del Pilar long gone, having died in Spain in 1896, Morayta was the last remaining mason of his generation who were conscientiously supporting the Filipino cause. As Kalaw would put it, “after the death of Morayta, the only one who had always shown interest in the Philippines, the only man in Spain for whom Filipino masons felt profound veneration and respect, the lodges considered themselves free to separate from the Spanish obedience.” (Fajardo, 67). Kalaw has decided to give up the fight – not only to confront and challenge the Grand Lodge of the Philippine Islands, but also to establish the Independent National Grand Lodge of the Philippines as a sovereign jurisdiction. Letter of Kalaw to Filipino masons: “The opportunity afforded by this meeting invites us to evoke this evening the ideals of love and fraternity because, as you all know, we have just carried out a most transcendental accomplishment by bringing the symbolic lodges of masonry under the jurisdiction of Grand Lodge of the Philippine Islands. I may state here that we, the masons of the old Oriente Espanol, did not come to this fusion without a background of nobility. We have our own glories, our own traditions, and beautiful and magnificent record, full of heroism and sealed with our blood. We have not sought this fusion to vent any grudges against the Oriente Español. Far from it. We have only words of gratitude for the Oriente, to which the Filipino people are indebted for having brought to them, in the midst of the surrounding darkness, the resplendent light of Masonic truth. Our only and exclusive reason for agreeing to the fusion was to save our most important principle: Masonic unity." On 31 March 1918, the Gran Oriente Español was informed by Kalaw that its lodges in the Philippines had all joined the Grand Lodge of Philippine Islands. These lodges returned their old charters to the Gran Oriente and began a new stage in the history of their lodges (Fajardo, 76). The history of the establishment of grand jurisdictions in the Philippines was reflective of the parallels that Philippine society has had in its own social evolution. Filipino masons had long been part of the historical tradition of asserting democratization in their society, and bringing to the fore the idea of self determination and independence. These principles – governed by the basic tenets of Masonic morality, rationality and enlightenment – had also guided the Filipino masons in their own organizational structure specifically in the establishment of grand lodge jurisdictions. Racial bigotry, colonial imposition, pride and arrogance were real stumbling blocks realization of a truly independent and democratic organizational mechanism in the governance of Masonic institutions in the past. The history of democratization and independence in Philippine masonry continues. Fajardo, Reynold. 1999. The Brethren in the Days of Empire: Philippine Masonry from the US Colonial Era to the Commonwealth Years. Manila: GLP. Kalaw, Teodoro. 1956. Philippine Masonry: Its Origin, Development and Vicissitudes up to Present Time. (translated by Frederick Stevens and Antonio Amerchazurra. Manila: McCullough. The Letters of Apolinario Mabini. 1965. Manila: National Historical Institute. Gealogo, Francis. 2009. “On the Question of Masonic Jurisdictions,” IGLPI Journal, 2, 52-56.